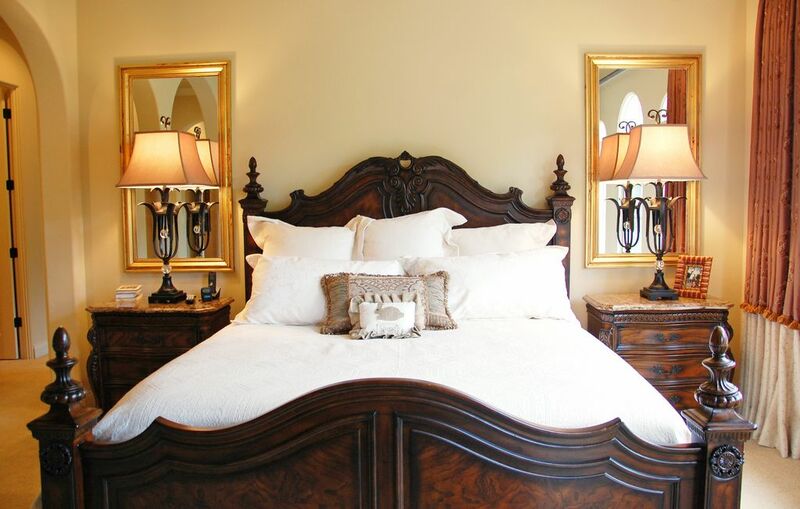 Interior designers know a successfully designed room includes mirrors. Large mirrors, small mirrors, square mirrors, round mirrors – all mirrors reflect light, make a room seem larger, and add a dimensional element to the space. Additionally, leaning floor mirrors give the illusion there may be another room just beyond the reflection and floor to ceiling mirrors double the space visually. Designer Tip – Be mindful of what is reflected in the mirror. When using a mirror over a fireplace mantel, be sure the reflection isn’t a ceiling fan, air vent, or other unsightly item. This large scale mirror appears to be a doorway into an adjoining room – or perhaps another world – as in the classic childhood tale, Alice Through The Looking Glass. If there are small children in the household, chances are they will try to step into Wonderland, so always secure a leaning mirror to the wall with a safety strap. Three medium sized mirrors hung side-by-side decorate an expansive wall space and reflects the furnishing from across the room adding great dimension and visual impact. Modern circle mirrors that mimic portholes on ships are hot right now. They come in many sizes – framed in gold and silver – and look amazing in modern spaces. Inexpensive mirrors are readily available at local home stores and craft stores. Display these small mirrors in a collage to dress an entire wall with great architectural impact. By placing mirrors behind a light source, the light is reflected back into the room instead of being absorbed by the wall. This technique is used by interior designers to brighten the darkest of rooms. Shop The Look – Wayfair and Bellacor are online retailers that carry a large selection of mirrors at reasonable prices. The porthole mirror pictured above – The Junius Round Gold Circle Mirror $363.